Studying the Bujinkan arts is like going back in time. In this respect the study of sword is typical. Historically, the Chinese Ken evolved into the Tachi, that evolved into the katana. 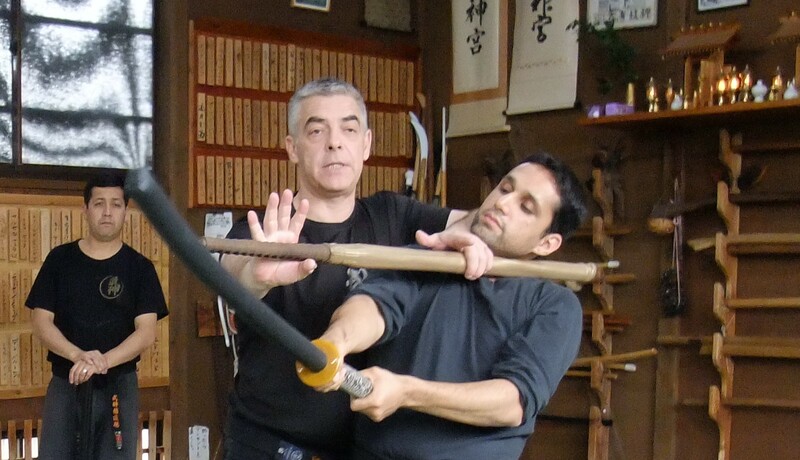 In the Bujinkan we have always studied the sword but some years were specifically dedicated to it. In 1996 we studied the kukishin biken jutsu. In 2004, the Kukishin again. In 2010, the Tachi waza. In 2013, the Chinese Ken. As you know I am training and researching a lot to understand the theme of this year. The many hours spent so far with this new weapon lead me to find similarities between the ken, the hanbô and the Tachi. The Tachi is the closest type of sword to the Chinese Ken that we have in the Bujinkan. surprisingly knowing Tachi waza was a great help to understand the basics of Chinese Ken. The Japanese samurai were using the Chinese Ken at the origin but the development of horsemanship has created a need for a different weapon. They created the Tachi. Tachi waza is one hand as the Ken is. Tachi is used mainly to stab not to cut. Exactly like the Ken. Tachi can change from right hand to left hand. The Ken too. The Japanese developed the techniques from Ken to Tachi to katana but in the Bujinkan we are studying it reverse. Why is that? My understanding is that the only way to be proficient with these weapons was to learn it that way. Going back in time allowed us to rediscover the reasons for which the movements were created. Hatsumi sensei once again made it possible for us to increase or understanding if this fantastic. And he used the best approach possible: going back in time. Learning the katana facilitates the learning of the Tachi. Learning the Tachi facilitate the learning of the Ken. Koimartialart just uploaded the Tachi waza online. The Kukishin and Togakure biken jutsu are also available there. You want to be proficient with the sword? Good! Then study hard. Knowledge comes only through and with physical training.